The George Harrison and Pattie Boyd wedding photo. Left is manager Brian Epstein. 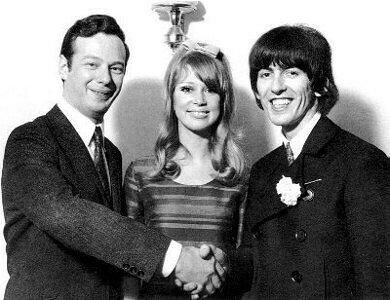 Brian Epstein with George and Pattie. One of the first things Harrison said to her was "Will you marry me?" Boyd laughed, so Harrison said, "Well, if you won't marry me, will you have dinner with me tonight?" Several days later, when Boyd was recalled for another day's work on the film, Harrison asked her out again and she accepted, having ended the relationship with Swayne. Their first date was spent at the Garrick Club (a private gentlemen's club) in Covent Garden, in the company of The Beatles' manager, Brian Epstein. George Harrison and Pattie Boyd met on the set of A Hard Day's Night. Ringo Starr had gone on holiday abroad with their wives, distracting journalists from finding out about the wedding. Pattie had started living with George at Kinfauns in 1965. Boyd and Harrison later went on holiday with Epstein, staying at the Hotel Cap Estrelle near Eze, in the south of France. Press footage of George Harrison and Pattie Boyd wedding.